This is seriously good Grappa made by the dedicated, innovative family that virtually invented the category … Bellisima! The Nonino family have been instrumenta … no, they have been indispensable to the growth, development, and prosperity of Grappa. The Nonino Distillery was established in 1897 by patriarch Orazio Nonino in the Friuli region of Italy. They’re responsible for some of the most important innovations in the Grappa industry, almost single-handedly revolutionizing a once poor-man's leftovers into a delicacy of the highest order. And—even rarer today—this producer is still family owned and operated. Truly, their list of accomplishments over more than 110 years are too many to list here, but they include novel methods of distillation, the salvation of several traditional grape varieties that had actually become banned, and the invention of an entire new category of distilled spirit, branded as Ùe (pronounced “Oo-ay”). Today their five artisanal distilleries are run by Benito and Giannola Nonino with their three daughters and they produce a wide variety of Grappa, Wine, and related specialty beverages, including another new product to the world—artisanal distilled honeys. Most great food inventions do not begin in the halls of the rich or at the hands of trained professional. Most come out of desire and necessity in the hands of the lower classes, scraping by to make the most of what is at hand. Grappa is one of these. It is made from the fermented and distilled left-overs after the wine has been pressed—skins, seeds, even the stems. The Nonino Familia has transformed this poor-man’s Brandy into an art form. 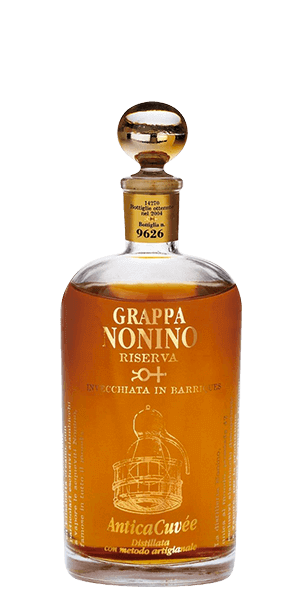 Nonino Grappa Antica Cuvee Riserva is some of the best aged Grappa available. The current issue is a blend of Grappas from Cabernet, Merlot, and Schioppettino grapes, aged in new Limousin oak and vintage ex-Sherry casks. And although some of the Grappa in this blend might be as young as four years, Nonino Grappa Antica Cuvee Riserva is composed of mostly much older vintages. This is seriously good Grappa made by the dedicated, innovative family that virtually invented the category. Bellisima! What does Nonino Grappa Antica Cuvee Riserva taste like? The Flavor Spiral™ shows the most common flavors that you'll taste in Nonino Grappa Antica Cuvee Riserva and gives you a chance to have a taste of it before actually tasting it. Orange zest, sultanas, and butter croisants. Stone fruit … apricot … and almond. Smooth and disarming, gentle spice. How to Find a Good Grappa?